Be captivated by the mystique of our city, you'll love the panoramic view of our rooms and the warm atmosphere of our hostel. We have 3 spacious rooms with private bathroom and panoramic view to the hills of Valparaiso. We also have 3 rooms with shared bathroom ideal for backpackers. We put emphasis on cleanliness, friendliness and tranquility to ensure a truly comfortable rest to our passengers. We have 3 spacious rooms with private bathroom and panoramic view to the hills of Valparaiso. We also have 3 rooms with shared bathroom ideal for backpackers. 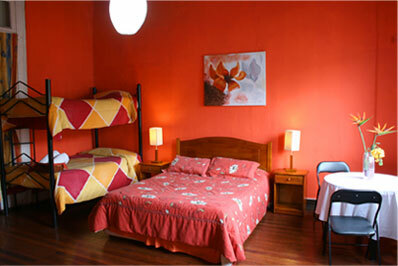 Located in the neighborhood "El Almendral", in the heart of downtown Valparaiso. Walking distance to shops restaurants and banks. Rates shown on the website are only valid the day of trading. The rates apply to their respective position, only if the desired service book, because otherwise these rates may vary. A reservation is considered complete when you have a confirmation number and the corresponding charge is applied. When booking, you confirm that you accept our reservation policies, payment, and cancellation demarcation of responsibility. All reservations are subject to availability at time of processing your request. The availability can not be guaranteed until full payment is received. To prevent against time, you must print your voucher and present it at the time appropriate to require the pay service. If you want to change or cancel your reservation, please contact as soon as possible, with the administration of Hostal Costa Manantial, stating your reservation number. Please read carefully our cancellation policies. Any change of reservation is subject to availability and re-listing fees. For more information, please contact your assigned Travel Consultant, stating your reservation number. The only way to confirm your reservation is made one of the 50% of the total price of your booking. The balance of the total payment must be paid at time of check in (arrival) and not when the CHECK OUT (withdrawal). For payment of your reservation, we accept bank transfer . You can also use transfer via Western Union. For more information please contact the Booking Telephone: (5632) -3178390 or (569) 66978022. Reservations canceled 4 days (96 hrs.) Or more prior to check-in (arrival) are subject to a charge of 10% of total reservation. Reservations paid and who wish to be canceled 4 to 0 days prior to check-in, not in case of No Shows will not be refunded for any reason. Likewise, no repayment of monies applied for early departures. For the seasons of Christmas, New Year and Easter, the cancellation policies are different, if you want information, please contact the Telephone Booking for Hostal Costa Spring or via email. Located 4 blocks from the bus terminal in Valparaiso, between France and General Cruz Avenue, next to the park Italy.